As I have posted about many times, there is absolutely no reason you have to cook with cookware made by anyone other than members of our extended American family. I discovered a new brand the other day that had previously eluded my attention. 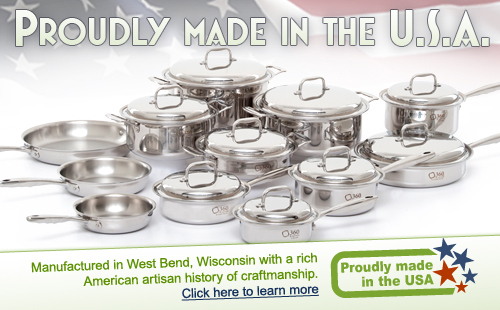 360 Cookware is manufactured in West Bend, Wisconsin by Americraft. As I have observed before, Wisconsin is the shining star when it comes to domestic consumer good manufacturing. If you are in need of any new cookware, I urge you to visit Americraft’s 360’s website pronto. Bon Appetit! This entry was posted in american made, cooking, Food, Kitchen, Made in America, made in usa and tagged 360 cookware made in America, 360 Cookware made in usa, american cookware, americraft cookware made in america, Americraft cookware made in usa, Made in America, made in america products, Made in the US, Made in the USA products, Manufacturing, us made cookware. Bookmark the permalink.